This week I spoke at Bangalore DevOps meetup on the topic "The story of SonarQube told to a DevOps Engineer". I have started writing TalkNotes inspired from Martin Fowler.Unlike his detailed article my posts aims to help the audience better understand my slides. SonarQube is a open source code quality management platform. It was a 30 mins talk focused at the need, setup, CI Infrastructure and administration of the SonarQube to the DevOps community. I have started the talk with one of my favorite subject Technical Debt. We have also looked at some of the parameters which determines the quality are coding standards breach, duplication, lack of unit tests, bad distribution of complexity, Spaghetti Design etc... I have spoke about this in more detail at previous post. There are various existing tools that helps reduce the technical debt by improve the code quality. What was missing was a easier way of tracking these code rule violations. For examples I need to know how much debt was introduced or was cleaned up? As a developer how do you quantify improvement the which a particular code refactoring has brought to the team etc.. 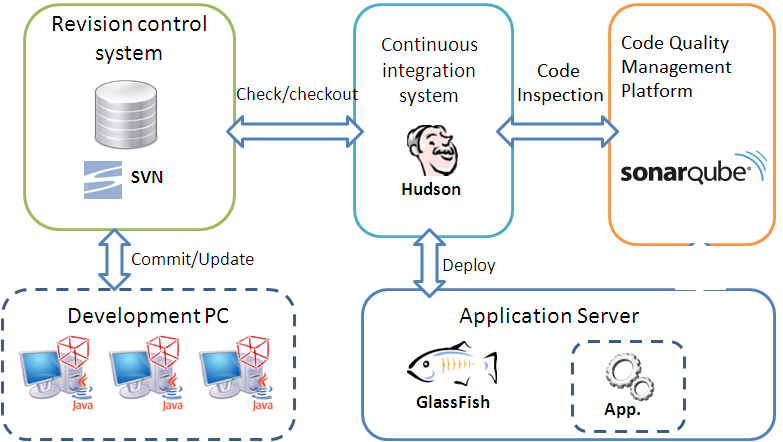 The below diagram shows the CI environment including SonarQube. The Hudson plugin for SonarQube can be configured by following the wiki. Image Idea from this blog. The best part of sonar is its documentation. This was the most comprehensive documentation I have read about any open source product. You just need their wiki page to get 99% of answers. Now that I have it configured hope to write more about it in the coming moths.